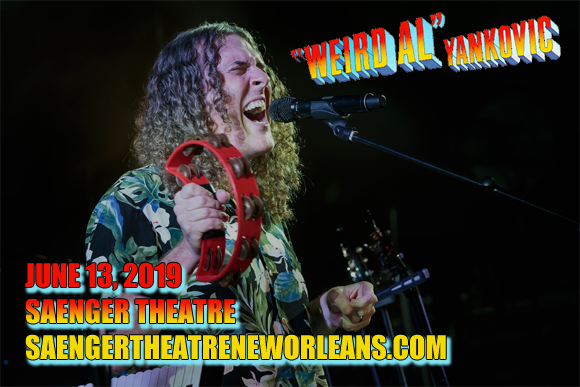 Everyone's favorite kooky, accordion-playing uncle, Weird Al Yankovic, comes to Saenger Theatre – New Orleans on Thursday 13th June 2019 on his Strings Attached Tour! Fans will have the opportunity to see Al perform like never before, with the backing of a full symphony orchestra! Expect to hear a variety of the songwriter's parody hits, like "White & Nerdy", "Amish Paradise" and "Like a Surgeon", but with bigger production, props and costumes, and a bigger sound, than ever before! Best known for his satirical parody songs, American comic singer-songwriter, film/record producer, and author "Weird Al" Yankovic released his debut single, a parody of "My Sharona" by The Knack titled "My Bologna", in 1979. The following year, Yankovic performed another parody, "Another One Rides the Bus" (a pastiche of Queen's hit, "Another One Bites the Dust"), live on the Dr Demento Radio Show, and by the following year it had become so popular he was invited to perform it on The Tomorrow Show with Tom Snyder. To date, Yankovic has written over 150 parody and original songs, selling more than 12 million albums, and he has performed over 1,000 live shows throughout his career. He has earned four Grammy Awards from 11 nominations, and he has released four gold and six platinum-certified albums in the US. In 2006, nearly thirty years after his career began, Yankovic had his first top ten hit with "White & Nerdy", which came from the album Straight Outta Lynwood – another top ten first for Yankovic. 2014's Mandatory Fun, his latest release, hit the number one spot in its first week of release, becoming his first number one album.